For IT News Week 1 of Jan 2019, pay attention to Digi's new digital payment offering. Fuji Xerox, a leader in the Document Services and Communications space announces the launch of 14 new models of digital color multifunction printers: the ApeosPort-VII / DocuCentre-VII Color series. 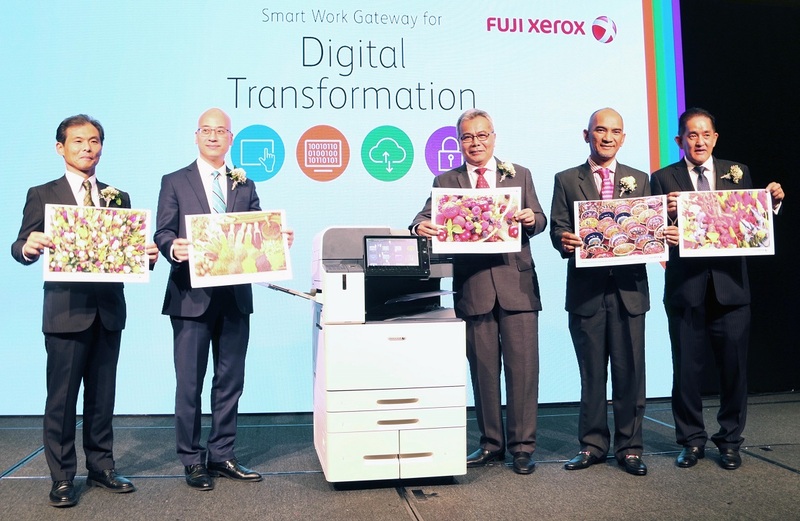 With the concept of “Smart Work Gateway Note1 for Digital Transformation” these new series aim to help Malaysian companies especially SMEs to accelerate growth, productivity and efficiency in the digital economy. (From left) Mr Shin Yasuda, Senior General Manager of Marketing, Fuji Xerox Asia Pacific Pte Ltd, Malaysia Operation, Mr Mark Tan, President, Fuji Xerox Asia Pacific Pte Ltd, Malaysia Operation, YB Datuk Seri Mohd Redzuan Yusof, Minister of Entrepreneur Development, YBhg Dato Haji Sahimi Bin Sani and My Johnny Loy, Senior General Manager of Sales Operation, Fuji Xerox Asia Pacific Pte Ltd, Malaysia Operation, during the launch of Smart Work Gateway for Digital Transformation. He emphasized that the government welcomes industry leaders such as Fuji Xerox to support and partner with the ministry in structured programs that can promote the adoption of the digital economy among Malaysian SMEs. The all-new ASUS ZenFone Max (M2) is a value-packed high-performance smartphone fully upgraded with 6.3" all-screen bigger display, high-capacity 4000mAh battery, AI-enhanced camera and powerful high-quality audio. Homegrown e-wallet, Boost, today announced that users can enjoy a cashless shopping experience at Watsons, the world’s largest international health and beauty retailer, in more than 450 outlets across Malaysia. This long-awaited collaboration is aimed at contributing towards Malaysia’s aspirations of becoming a cashless society while offering convenience at its best. Alongside officiating this partnership, Boost and Watsons also jointly announced huge loyalty point rewards for customers during the upcoming Chinese New Year period. From 15 January until 4 March, customers who shop with Boost at Watsons outlets and online store will earn extra 8x Watsons points. Caryn Loh, Managing Director of Watsons Malaysia, said that Boost also serves as payment option when shopping at Watsons online store. Crossword Cybersecurity plc (AIM:CCS), the cyber security technology commercialisation company, has today released insights from its global review of academic cyber security research. The new database looked at nearly 1,200 current and past research projects from academic institutions in the United Kingdom, United States, Europe, Australia, and Africa. It reaffirmed the value of the cyber security research market, with reported funding of EU projects at over €1 billion. Privacy - Projects related to privacy have increased by 183% in recent years. TalariaX, a Singapore-based leading industry player in enterprise mobile messaging solutions, today launched sendQuick.io, one of the most integrated messenger platforms currently available for the enterprise and telco markets in Asia. This omni-channel messaging platform and flagship solution integrates 10 popular social messenger platforms - Facebook Messenger, Webex Teams, WeChat, Telegram, Slack, Microsoft Teams, WeChat Work, Line, WhatsApp (integration completed, not launched) and Viber (integration completed, not launched) - using a single Application Programming Interface (API). sendQuick.io key features include: Omnichannel Messaging, Easy Configuration, Unified Applications Integration, Broadcast Messaging and Anytime, Anywhere Data Access. McAfee, who with D-Link has presented the latest D-Link Exo Router Series at CES 2019. These routers features D-Link’s proprietary Wi-Fi Mesh technology, which allows users to mix-and-match compatible routers and extenders to create a network tailored to their home networking needs. As more consumers enjoy the benefits and convenience of a connected home, cybercriminals are likely to exploit trusted devices like smartphones and tablets to try to gain control of IoT devices. This underscores the need not just for robust endpoint protection on all devices but for home networks. The McAfee Secure Home Platform automatically protects all devices connected to the network, and emerging threats are identified and blocked thanks to McAfee’s Global Threat Intelligence. Advanced parental controls help ensure the safety of kids so that parents can rest easy. McAfee LiveSafe provides on-the-go protection when users are away from home. One simple app lets you monitor and control your devices so that your family stays connected and protected. IBM (NYSE: IBM) inventors received a record 9,100 patents in 2018, marking the company’s 26th consecutive year of U.S. patent leadership. IBM led the industry in the number of artificial intelligence (AI), cloud computing, security and quantum computing-related patent grants. IBM inventors patented an intelligent system that could be used to identify, characterize, and monitor vertical temperature profiles and gradients, which affect marine life, in lakes and other aquatic ecosystems. IBM has patented an AI system that could, with permission from the primary user, analyze conversation patterns between two parties in order to identify attempts by one of the parties to deceive the other. The majority of unstructured data comes from sources that are woven into the fabric of our daily lives. These include our social interactions, emails, videos, photos, and many others. Global research firm IDC forecasts that such global data will grow to 163 zettabytes by 2025. For enterprises across the region, data and digital transformation remains as a key focus in this digital era as well. Modern digital management like object-based storage architectures, enable businesses to deal with drastic growth of data, while improving the ease of use and proving flexibility to scale capacity and performance. The Hitachi Content Platform (HCP) portfolio is one example that is based on an object storage solution to manage and govern data of businesses. To better understand the current state of the object storage market in the Asia Pacific Region, Hitachi Vantara, a wholly owned subsidiary of Hitachi, Ltd. has partnered with IDC, to survey almost 4,000 IT professionals and executives in the region. The recently published white paper entitled, “Digitalization of the Business with Object Storage,” highlights the key findings from this survey. The survey reveals that businesses are planning to store their data for more than 5 years, with a significant portion planning to store them forever. However, almost half of the surveyed enterprises are unaware of object storage, with Singapore seeing the lowest awareness at 52%. Huawei has just announced the industry's highest-performance Advanced RISC Machine (ARM)-based CPU. Called Kunpeng 920. The new CPU is designed to boost the development of computing in big data, distributed storage, and ARM native application scenarios. It significantly improves processor performance by optimizing branch prediction algorithms, increasing the number of OP units, and improving the memory subsystem architecture. At typical frequency, the SPECint Benchmark of the Kunpeng 920 CPU scores over 930, which is 25% higher than the industry benchmark. At the same time, power efficiency is 30% better than that offered by industry counterparts. Kunpeng 920 provides much higher computing performance for data centers while slashing power consumption. Huawei today also released its TaiShan series servers powered by Kunpeng 920, including three models: one with a focus on storage, another on high-density, and a third focused on balancing both requirements. The TaiShan servers are built for big data, distributed storage, and ARM native application scenarios. Huawei believes that an intelligent society with all things connected, sensing, and intelligent is underway, and this trend is picking up speeds. The development and convergence of ARM-based applications on smart terminals are accelerating, along with cloud-device collaboration. In addition, new applications in cloud computing are driving data diversity.